I wrote this for another forum, I thought it might be useful here too. The hazard switch and indicators often cause problems in defenders, most commonly the indicators stop working, but the fault is actually with the hazard light switch. This post aims to explain how the hazard switch works, why it's malfunction stops the indicators working, and how to test for and diagnose the fault. To get to the back of the hazard switch, remove the two screws and pull the switch panel out. you'll then see this. The multi plug has 7 wires going into it, there's also the Black (red trace) and Black wires, which are connected directly to the switch body. these are for the indicator in the switch itself. Remove the multiplug, you will then see the two sets of pins, x3 and x4, top and bottom (as viewed in the photo, not as mounted in the dash). The top set are concerned with powering the flasher unit, the bottom set dictate what the flasher unit actually lights. To make things easier to see, here is a schematic of the switch. 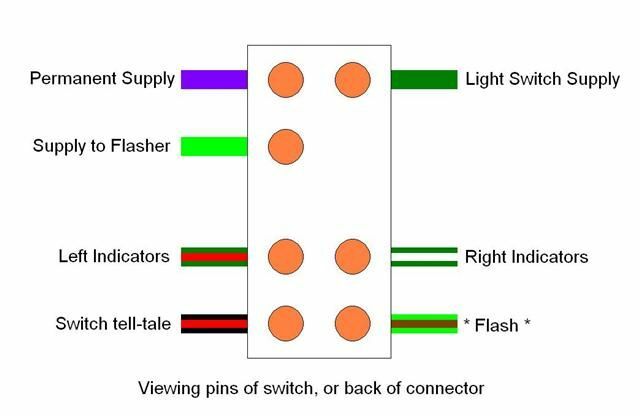 What this means is, if the switch is faulty, the flasher unit doesn't get a power supply, so it can't flash the indicators via the indicator switch on the column. You can test the switch using a multimeter (continuity or resistance), or test lamp. You can also test the vehicle wiring as follows. You will need a fused piece of wire (or test lamp), you don't want to risk a dead short if you get it wrong. 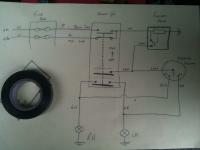 This is what i made to test the wiring, the lowest value fuse i had was 5A. If you link 'permanent supply' (purple) to 'Left indicators' or 'Right indicators' the indicators on that side should light, constantly though, not flashing. this proves the bulb wiring is ok and you have supply to the loom plug. If you link 'permanent supply' (purple) to 'supply to flasher' (light geen), the indicator stalk switch should work the indicators as normal (flashing). The indicator switch is connecting *flash* to 'Left Indicator' or 'Right Indicator' - the wiring is duplicated at the stalk switch. If you want to make a seperate link wire you can replicate the stalk switch action at the loom plug as well. You can repeat the two tests above, using 'Light switch supply' instead of 'permanent supply', the ignition switch will need to be on the second click. 'Switch tell-tale' is the live supply to the bulb in the switch housing, it is grounded by the seperate black wire connected to the switch body. I'll have a link put in the Tech Archive. Location:back into a normal life....want to leave again. thanks a mil this helped me no end today. In the end it was the fuse for the hazzards that made them not work. But i learnt how they work in the process. Good write up Luke, nice and clear. For info, the wire shown as dark green here is white with a green trace in the TD5 defenders. Make sure this is not confused with the green with white trace wire. Also for info, for a TD5 HZ switch, to get the little light in the button to illuminate you join the black/red wire with the orange/red wire. My 86reg 90 with original loom, the dark green wire had a small white rubber band marker on, this attaches to the White with green trace wire as Kev says. Hi could some please help have mot tommrow at 2 pm have all indicators but no hazards tryed 3 switches in my mates truck they all work but put any in my 90 all indicators work but no hazard lights and one is brand new ??? could it be all switchs cause its only the switch that dose the hazards not any other wiring as i understand from this post ?? If you've tried 3 switches that all work fine in anothe vehicle, I think it is pretty safe to say it's not the switch. Do you have a multimeter or a test lamp? If you have a spare length of wire or lamp you can test the wiring at the hazard switch connector, as described above. Ok, slow down a bit. If you link 'permanent supply' (purple) to 'supply to flasher' (light geen), does the indicator stalk switch work the indicators as normal (flashing)? Do the test with the ignition off. How do you test the switch? it either works or it doesn't, it's just a rocker switch, maybe the slider bit inside is dirty or worn. I've just been down to the landy and tested the switch with a multi meter. At first it was'nt working when tested, then when I switched it on and off it started working. It must have been a bit dirty inside. One of the pins/terminals on the back of the switch was a bit corroded so I cleaned it up. Put it back together and the hazards started working again. Happy Days. P.S a very helpful thread. The flasher relay on my 1988 110 is energising (clicking) all the time even when the hazards/indicators are not turned on. The strange thing is that the indicators are not coming on when it clicks. The indicators work fine when selected but when turned off again the relay continues to click. The clicking is not consistent as when the indicators are selected but instead erratic. If I turn my lights on it reduces the frequency of the clicking but it still does it occasionally. I put the M.meter across the light green and earth on the flasher relay and it always has 13v across it (with engine running) as it ony happens with the IGN on. If I turn the lights on it drops to 12.8v and it reduces the frequency of the clicking. I assumed this was due to a short cicuit so I pulled my landies wiring loom to pieces and sepreated all the wires but it still happens. I have checked all the indicator associated connections and cannot find a short there, so I am at a loss as to what else it could be. The only theory I have left is because it only happens with the IGN on there is a fault with the hazard switch across the Green - Light green connections but I have checked this with the m.meter too and it appears to be fine too. I have read the following article and all works fine. BUT I CAN'T STOP THE CLICKING ITS DRIVING ME MAD!! Ok so I've changed the Hazard switch for a new one which has reduced the frequency ofthe clicking but not erradicated it entirely which leads me to believe that the switch was on its way out but not the cause. Since it only happens with the ingnition turned on then it leads me to believe the fault is IGN feed but I cannot find any shorts on this line and all voltages/currents are correct. The only thing I can think maybe the problem is the trailer socket so Im going to disconnect that now and see if it cures it. Beyond that I am lost. have you tried a new or known good flasher relay ? it maybe your relay has a problem. Yeah, have changed relay, hazard switch, steering column switches. Disconnected trailer electrics but has made no difference. 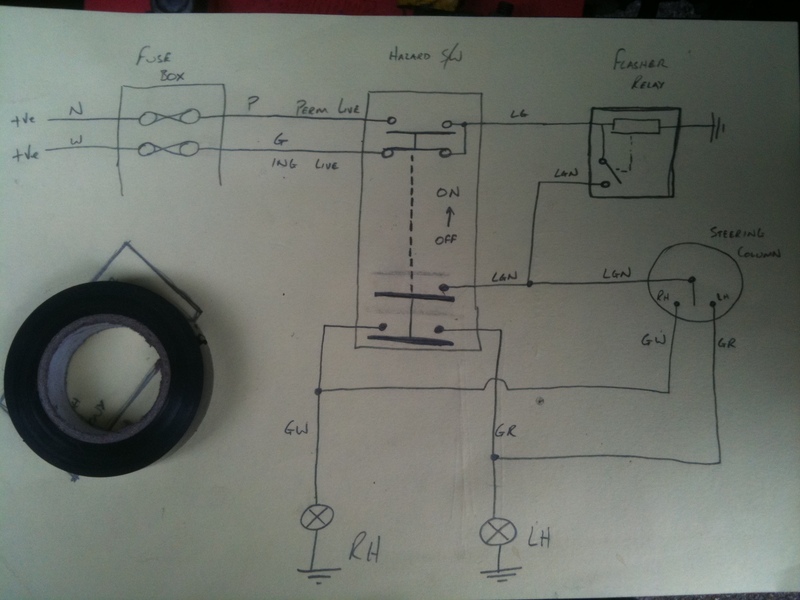 Have drawn a circuit diagram which I'll upload later when on computer rather than iPhone. It may help someone else out in future. I doubt it. I suspect the ignition needs to be on to make the problem appear, but is not actually the cause of it. Sorry, I don't think the IGN feed is the promblem but rather the problem is somewhere on the IGN feed. As you can see from the diagram the flasher relay uses the same power feed to activate the relay and also power the bulbs which would imply that the flasher relay should click constantly as it always has power. I know it is not as simple as this, I assume the other components in the flasher relay and Haz switch are there to prevent this. My understanding of electrics doesn't go as far as understanding how this actually works. Can anyone explain this? Its 'flash' is dictated by the load on the output side of the relay. normal current flow - normal flash. Since yours is on a quick flash all the time, there is a current flowing somewhere, though it's unlikely to be a dead short as that'd pop a fuse. It is very likely that the issue is with the output from the relay, before it gets to the indicator switches, or the hazard switch - the Light green/Brown wire. For info, I had a look inside a flasher relay not so long ago, and there's a fair bit in there. I didn't have time to investigate further. The relay in question is wired with a single constant supply (albeit after the main vehicle FIA switch) and works fine. There are no extra components inside a hazard switch, apart from the tell-tale bulb. i have a similar prob. my indicators stopped working in traffic one day. ive replaced the switcg relay and column switch. ive done the tests as in this tread and left and right work fine on the steering. ive had the dash out and cant find any loose wires. Just to let you know that it is possible to take the switch apart and clean up the contacts inside. Obviously if anything has broken inside then this is no use, but I managed to get my indicators working properly again by stripping and cleaning the switch. There are small plastic pins and springs inside so work on a clear table just in case! If you hold the switch with these pins upwards then the springs and plastic pins inside will remain sitting in the rocker part of the switch. Place this rocker part aside as this shouldn't need any attention. There are the two side spades for the rocker light which may come loose as you lift the back away. Push them back making sure that they sit tightly against the contacts inside. Inside the back of the switch you will see a white plastic piece which will fall out easily. Remember which way it goes! Behind this you can now clean up all the copper contact surfaces. There is one stiffer contact which needs to be bent up in order that you can clean underneath. Gently do this with a small screwdriver, clean the contacts and then bend back. (it was this one that was dirty on mine). To do this I cut a thin strip of wet and dry paper, folded it over the end of the screwdriver to form a mini 'file'. If you have a tester then you can check that the contacts are now clean and working. Reassemble and there you are! I also have a problem with my indicators. Whenever I indicate she blows the fuse for the indicators,fuel and temp guage. Could this also be linked to the hazard switch as the hazards are also not working? If a fuse blows as soon as you turn a circuit on, I would suspect a short circuit. Does the fuse blow when you indicate left? right? both? Have you tried unplugging either the flasher or the hazard switch to see what happens then?